While in yoga class, I try to teach that we must listen to our bodies while sometimes ignoring our minds. If we are getting ready to do crow pose, our minds might be protesting and creating unneeded fear based commentary. Face the unknown and lift your feet off the ground and see what happens. In this month’s Oprah magazine, there is an article about people subconsciously sabotaging different aspects of their lives because of deep fears. The act of facing those fears head on, asking “What is the worst thing that can happen” and thinking through the various outcomes of the scenario that creates the fear dissolves the fear. What is something that scares you? Traveling alone? Meeting new people? Getting up in handstand pose? How often do you put daily chores or meaningless responsibilities before what gives you peace, health and happiness? I’m not saying that we can ignore our responsibilities for selfish pursuits. Prioritize. I know that my mental state makes a huge difference in my family life. If I am stressed, it trickles through the family until we all are unhappy. Making sure that I take the time to do yoga, run and be with like minded friends makes me a better mom and wife. Because of that knowledge, I try hard not to schedule things during the time I can be doing those activities that give me health and happiness. That may mean I have to drag the kids to the grocery store because I used my free time to take a bike ride with friends but that is what I do because it matters most. I try to help children figure out what their strengths are so that they can take this creed home with them. Using games (like Thumball catch) that asks them questions about their interests and beliefs helps the children stop and think about what drives and motivates them. This can lead to decisions that will create a happy life based on who they are versus what people say they should do or be. Another great thing about yoga is that it is constantly evolving with the individual. Yoga teaches patience, perseverance, determination, focus, to trust oneself, to know when to push, when to wait and when to try again. Each time you get back on the mat the slate is clean. What great skills everyone needs to help handle setbacks in life. Breath deeply and appreciate the moment. Living in the moment could be the meaning of life. I love these and would love to know what creed you pick to live your life by. Please share! I am awaiting a book at the library called 104 Activities That Build: Self-Esteem, Teamwork, Communication, Anger Management, Self-Discovery, Coping Skills by Alanna Jones. I read some sample activities on Amazon and the ideas seemed easy for both young and old and quick to start. It would seem as though these activities would help improve sibling and family relationships and I can’t wait to try some over the summer with my little guinea pigs. Project One: Garbage Art Materials: Items around the house (such as toilet paper rolls, plastic bottles, lids, cans), tape, hot glue, regular glue, paints, makers and crayons. The children collect things around the house to recycle into a sculpture. They must work together to come up with an idea for their sculpture and then share materials to build their masterpiece. Have the kids create a few sculptures and create a museum to display their work. A yoga version of this project would be to have the kids create a human sculpture with yoga poses. Have the class try to move all at once as one piece of movable yoga art. The children pick one or two colors. They must decide on a picture (or you can suggest a theme or use a coloring book) and only use their own color to complete the picture. This forces each person to contribute and for the group to work together. I had a surprise on Sunday when I went to teach my final 5-7 year old class… no one showed up! It was Father’s Day so I’m sure all my little yogis were home snuggling with their dads. I had the blessing of a free Sunday morning to take a class for a change and Karyn’s Sunday class is one of my favorites. The class was mat to mat packed and, ironically, the women far outnumbered the men. I guess moms felt that dads needed one-on-one time with the kids on Father’s Day morning! Class started a bit late. We had just transitioned to the floor after an hour and five minutes with savasana getting closer when my life interfered with my yoga. The guilt I started to feel about leaving my husband (especially after he just got back into town late the night before from the most horrendous week of his life) made it impossible for me to stay for savasana—the icing on top of the cake in yoga. After working so hard on my mat—erasing the stress of the week and trying to ignore the dripping sweat from the man doing yoga inches away making annoying Darth Vadar breathing sounds—all I wanted to do was to rest in corpse pose and feel my muscles relax fully and find that feeling of rejuvenation. But it didn’t happen. I got up and left my oasis of peace behind. Kids, too, LOVE savasana. Some may have trouble, as adults do, succumbing to the power of savasana but once they do, it is craved and something to which they look forward. I had a boy in my 5-7 year old class who would beg for savasana as soon as he entered the studio! I have rituals that I use in class for savasana. I use the “Savansana Song” by the Bingo Kids to get the children to start preparing their minds and bodies for rest. I dim the lights and have soothing music on in the background. I either do a series of asanas that promotes sleep (see below) or I use scripts to ease the class into relaxation. Each child has a breathing buddy (little stuffed animal) that I put on bellies to help them focus on their breath rising and falling. Some children like to bring their own from home. 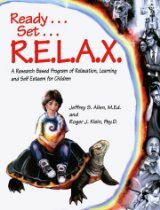 I have found a couple of wonderful books with different relaxation scripts (such as Ready Set R.E.L.A.X or Relax Kids: Aladdin’s Magic Carpet: And other Fairy Tale Meditations for Princesses and Superheroes) with affirmations that I use. I have also had the kids squeeze and relax different body parts from their feet to their heads to release tension and promote relaxation. I come around with wonderful smelling aromatherapy oil to dab on inner wrists once everyone is settled. After three to five minutes, I begin to end savasana and have the kids come back into their breath and bodies by wiggling toes and fingers. Some kids don’t want to wake up while other kids jump up instantly to help me with the lights as their little bodies or minds are eager to move again—rested and refreshed! It is often noted that the more we are consciously grateful for the happier we are in life. Oprah once said, “If you look at what you have in life, you’ll always have more. If you look at what you don’t have in life, you’ll never have enough”. I believe this to be true. There have been times when after being very content with my home and lifestyle I go to a new friend’s home and come back feeling less enchanted by my possessions after being exposed to their possessions or style. I am ashamed, but it’s true. I also find that shows on HGTV and various catalogs that get uninvited into my mailbox make me covet and feel dissatisfied. As a parent, I have been disappointed by my children when it comes to being ungrateful for the abundance in their lives. I do not buy frivolously (although my husband might think otherwise). My children don’t often get things “off season” of birthdays or holidays. So where does being ungrateful of possessions or gifts of experience come from? I think that it takes practice to make being aware of your blessings a natural daily act but I do believe that it is possible. How do you teach children about gratitude? Here are a few ideas. A book I have mentioned previously called 10 -Minute Life Lessons For Kids by Jamie Miller offers four ideas to teach gratitude. The following idea is a visual representation of seeing your blessings which can help make an impact. First, fill a saucer with a half cup of salt. Have a child sprinkle a small amount of pepper over the salt and stir the pepper around. Next, the child holds the plastic spoon over the salt and pepper without it touching but close to it. Explain that the pepper represents the blessings in our lives and that it is often hard to see those blessings when they seem to be outnumbered by our problems or our “wants”. Focusing on what we don’t have makes us feel empty like the spoon. Now have the child rub the spoon with the woolen cloth and hold the spoon over the bowl again. The pepper should be attracted and stick to the spoon. Stopping often to think about our blessings in life (positive relationships, nature, conveniences in life) makes our hearts grateful and open to seeing the good in every day. Another activity to encourage gratitude is to make a gratitude journal. Have your child make a special journal to write down daily something for which they feel thankful. Or, make a special box that your child can keep souvenirs from experiences that they are thankful for as a visual reminder. One thing that my family does regularly at dinner time is to go around the table and talk about something good that happened during the day. Sometimes I specify saying something that they are grateful for and sometimes we just talk about the positive moments of our days. Thanksgiving is not the only time to remember to be grateful. Make it a habit and see if it brightens up each day. I am grateful for the ability to teach yoga, share my ideas, and for you, my readers. I have had a very tough week with mourning the death of my mother-in-law. My husband’s family dynamics were complicated and the emotions accompanying her death were varied and ran very deep. I am emotionally drained today. To make matters more stressful, travel home was delayed because of weather and my children and I didn’t get home until mid-night only to wake up to the final Friday of school and all the neglected forms to be signed for school parties and homework to be finished. We all were tired and the day started off hectic to say the least. Morning meditation was not in the picture and I don’t think a deep breath was taken until the last child was out the door. What to make of the day ahead? To start, a walk with the dog and my mother to help sort out the last few days events and clear my head. It’s funny how the act of talking about something doesn’t always work to clear the mind at all. In fact, I find rehashing certain moments, mostly negative energy moments, to work in the opposite way. I have read in another favorite blog written by Gretchen Rubin called the Happiness Project that talking about problems or venting doesn’t make you feel better or happier at all. A good yoga practice or meditation is much better at clearing thoughts and creating peace. The act of focusing on the present moment works wonders with depression and sadness. Thinking about the past or worrying about the future does not help; you can’t undo the past and most things one worries about don’t come to fruition. It seems so obvious, but it is so hard sometimes to do the thing that helps the most—taking time to breath. I also had on my to do list for the day to teach my final 3-5 year-old class. This class has been a joy to teach but also comes with its own challenges. Class is at the community center and is labeled an “enrichment class” for the early childhood department. What that means is that the nursery school children come to my class after they have had lunch… on Friday. I had talked about the different energy levels of classes before. This class was comedic. The children would come in and we would start with breathing exercises and mini-meditation (cow and cat sounds) and then a sun salutation. One by one the children would have to excuse themselves to use the bathroom as their bodies digestive systems awakened in class. The disruptions are frequent and the different levels of potty training make class very amusing. The kids don’t want to miss a moment so there is always the request to wait before doing the next yoga activity and accidents have happened when things were fun and listening to body signals less important. I must say that today’s class was bliss. Because of end of the year graduation class celebrations, not all of the chidren attended this final class. The smaller class size created a calmer energy. We played with my new Thumball. I mentioned my excitement about this product in a past post and this new yoga tool works wonders. We used the ABC ball and did yoga poses based on the letter the child had his/her thumb on when catching the ball. We were scared hedgehogs in tight balls and sea otters lying on our backs, elephants spraying our friends and trees blowing in the wind. The end of class came quickly—savasana with breathing buddies, my special relaxation oil dabbed onto little wrists and temples and sometimes feet or tummies if requested and finally tiny voices remembering to shout “namaste” with hands to hearts. The end of the year hugs from these little friends helped remove a bit of the sadness that has clinged to (and sometimes drenched) me this week. Summer is here and with it comes deep breathes and the warm breezes and the excitement that comes with change. I love to start my classes with a breathing exercise. It helps the kids center. Depending on the type of breath it can also energize or calm. Some of the breathing exercises and tools that I use to help the kids remember the different types of breathing are listed below. Bunny Breath — this breathing exercise can be done with a prop or on its own. Starting in sitting hero pose or sitting on knees, you take 4 to 5 quick breathes in through the nose with a slow exhale out of the nose. Sometimes I will bring a flower or paper cups with cotton balls that have drops of essential oils such as lemon or peppermint or vanilla from my pantry for the kids to pass and smell as they use their noses like bunnies. This breath is very energizing as the body is getting a large amount of fresh oxygen from the quick succession of breaths. The Yoga Calm program uses a Hoberman Sphere to help children visualize their lungs expanding while breathing in and contracting while exhaling. This product is very effective, however, it is pricey. Another way to demonstrate the same action of expanding and contracting is to use a plastic slinky found at any party supply store. This way the entire class can use them simultaneously. I would use what YogaKids calls a Take 5 Breath with these tools. Breath in to a count of five. Hold the breath for one count and then exhale for a count of five. Another fun way to help children focus on their breath is to give each child a pom pom to place at the end of their mat and using a straw have each child try to blow the pom pom across their mats (or across the studio) using the least amount of breaths. This encourages slow, relaxed exhales. One final example of another tool for breath work is to give each child a pinwheel (or have the kids make their own) and have them watch the pin wheel while they exhale. Can they make the pin wheel move using breath from their noses? How hard must the breath be to create movement? All of these questions help students become aware of breath which is an important aspect of yoga. I will always strive to except all of life’s lessons, to grow from them and to keep creating challenges that continue that growth. Without change and challenges, complacency arrives and life becomes stale. Sadly today I am mourning the loss of the life of a family member. Her life and now death reinforces this belief for me for many reasons. Today I have decided to share quotes and writings that inspire me and motivate me and push me out of complacency and back into living. I have used some of these quotes to start a class discussion or as an ending in class during savasana. we are for what we could become. One of my favorite yoga teachers talks often in class about what she calls “head fakes”. She is referring to how people who do yoga may think that they are there to stretch or change their bodies, but in actuality the yoga is changing their minds. For example, while on the mat you learn how to breath through a difficult pose—coming to your breath instead of your mind or a reaction to come out of the pose—you relax and the pose becomes easier. This then translates when off the mat during a difficult situation or an argument when you find yourself coming first into your breath before reacting which likely changes the outcome of the situation. Another great yoga to life analogy is “how you are on the mat is how you are off the mat”. If you don’t try to get up in crow pose, do you also stop from trying new things in life out of fear? Or, if you break from a pose because it is difficult, do you also tend to not complete projects in your life or go after goals when things get challenging? Those life revelations or “aha moments” are what I love about yoga. So how does this apply to children? As parents or teachers I believe it is our role to help children learn about their strengths and who they are. It is a fact that if an individual knows what their strengths are and makes sure that their life is full of activities that put to use those strengths, they will have a more contented life. How do you learn about your strengths? Being aware of oneself and what activities bring joy is a great place to start. I have a game that my kids in class love to play that helps them think about who they are. I call this game yoga bowling. The kids can either sit in butterfly pose with their feet touching, or, to make the game more challenging, they can stay in a crab crawl position. They find a spot around the room and I roll a ball toward them (the pins). They can either move side to side in butterfly pose or scatter around in crab. If they get hit by the bowler, they must stand in tree or mountain pose and answer a question that I ask. My questions are all about them. What is your favorite activity after school? What is your favorite book? What is your favorite food? What is one of your favorite memories? You get the idea. What I find interesting is that the kids don’t end up trying hard to NOT get hit. They want to be asked questions about themselves. They want to share all of their skills, desires and favorites. Those questions are not asked often enough in their lives and yet the answers are so much more important to know than the capitols of each state. Try spending some of those rare quiet times with the kids in your life asking them questions about themselves and see their eyes light up. I just ordered a yoga tool that I am sooooo excited about. It is called a Thumball. I saw something like this idea in this months Family Fun magazine and was going to make a yoga version when I came across this great product line. Thumballs are soccer balls with different words printed on each hexagon. There are many versions such as “Ice Breaker” and “Who are You”. The idea is that whoever gets the ball picks it up and answers a question or does some activity where their thumb rests. Brilliant! I also picked up an animal and alphabet version as those will work well with games that require yoga poses. Another game that I recently discovered is called Totika. It is like Jenga however there are cards that have color coded questions. When you pull out a colored piece, you must answer the correlating question. The catagories are Life Skills and Principles, Values and Beliefs with a Self-Esteem deck also included with each. I have the Life Skills version on its way and will try it out on my family before bringing it into class.